EAST RUTHERFORD, N.J. — Breathe a little easier Philadelphia and surrounding areas. The Eagles are back and looking super. Just goes to show you what a little urgency, some big plays — and a timely game against the New York Giants can do for the defending Super Bowl champions. "It's a big win for us," said Wentz, who finished 26 of 36 for 278 yards and no interceptions. "NFC East and the conference. It's huge. Being 3-3 is better than 2-4. This is more like who we are. We can build from this." The win put the Eagles into a first place tie with Washington (2-2) in the NFC East with Dallas (2-3) a half game back. The Giants are fading fast. Wentz sandwiched touchdowns passes of 13 and 1 yard to Alshon Jeffery around a 10-yarder to tight end Zach Ertz to help the Eagles build a 31-6 lead. They beat the Giants (1-5) for the fourth straight time and seventh in eight games. 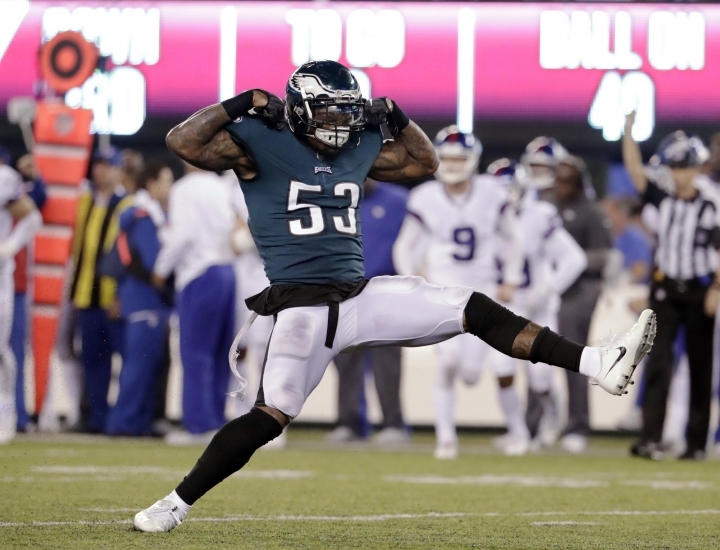 Corey Clement scored on a 1-yard run and Jake Elliott added field goals of 33 and 30 yards. "This is finally the game where we played like the Philadelphia Eagles," said Ertz, who was limited to seven passes for 43 yards. "We're finally the Eagles again." Eli Manning was under pressure all night from the Eagles. They sacked him four times and hit him 13 other times. He finished 24 of 43 for 281 yards. "We want to get after the passer every week," coach Doug Pederson said. "These games are battles. It all comes down to which team gets after the passer. We hit Eli and put him on the ground. That was big." Kamu Grugier-Hill intercepted Manning's pass that was tipped by fellow linebacker Jordan Hicks and he returned it to Giants 16. Three plays later, Wentz was forced out of the pocket and found Jeffery after getting all day to throw. "We didn't do anything well enough to win tonight," Giants coach Pat Shurmur said. "Credit Philadelphia. Good football team." "How do I feel about my performance tonight?" Barkley asked rhetorically. "Doesn't matter to me. We didn't win." Odell Beckham Jr. headbutted a giant cooling fan during a second-half fit that also included him screaming from the sideline and eventually being calmed by Barkley. Beckham also left for the locker room before the end of the first half, though Shurmur said Beckham was excused early because of cramping. Beckham said his tirade was just a bit of self-motivation. "I was just trying to get myself going," he said. "I felt like some of those plays where I was getting myself going was some of my best stuff. So I was just trying to get myself fired up. I did that and it helped me." Thursday's scene comes a week after Beckham bemoaned the lack of downfield passes from Manning and the team's subpar energy following a 33-31 loss to Carolina. Beckham had six catches for 44 yards Thursday, and his longest reception was 12 yards.